This is part of a series of memos presented as part of a workshop organised by the LSE Middle East Centre on 5 October 2018, looking at national identity and the Emirati state. What does art have to do with heritage? In the UAE, quite a lot. The country has recently seen a so-called heritage boom, in which the country’s history and identity have been marketised to both national and international audiences. At the same time that cultural initiatives have been solidifying notions of Emirati heritage and identity, an art scene has been developing alongside, and cultural authorities have been strategically using art to disseminate narratives about the country’s national identity. These narratives tell a past characterised by a Bedouin lifestyle, built upon coping with life in the desert, and the traditions and practices developed during that time. Although the UAE’s art scene might be predominantly engineered in a top-down fashion, artists carve out space for themselves to insert their own interpretations and perspective on current heritage narratives idealised by the state. To understand how young and critical UAE residents and citizens think about current heritage efforts, we need to investigate the discourses around contemporary art production and heritage more closely. 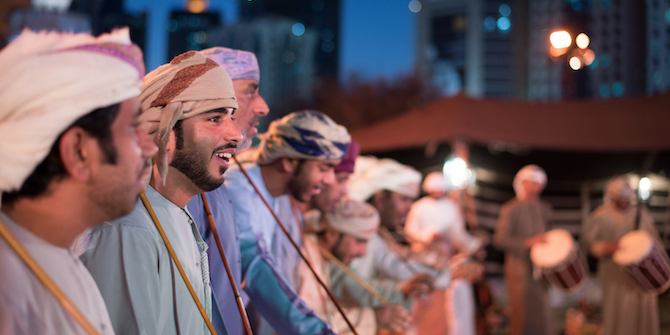 Cultural authorities in the UAE are responsible for initiatives involving both art and heritage. In festivities they organise, they let realms of heritage and art collide deliberately. The Qasr al Hosn festival for example, Abu Dhabi’s largest heritage celebration, features artworks that thematise national heritage. In Dubai, artworks that deal with Emirati identity are often displayed at the SIKKA Art Fair, located in the Al-Fahidi heritage district, where the privileged place of national culture is underscored by the district’s recent Arabised renaming (its former namesake was an Iranian town, Bastakiya). For artists who live and work in the UAE, their artistic engagement with heritage is motivated only in part by opportunities to exhibit in high-profile events and festivals. Indeed, many artists deliberately engage with national narratives as a way to respond to cultural and political developments in the UAE. It is not only Emirati artists, however, that respond to these different heritage tropes. Artists who grew up in the UAE but do not have citizenship – and cannot gain it – have an especially large stake in this conversation. How, specifically, these artists respond to heritage narratives depends on how they position themselves vis-à-vis those narratives as well as how they get positioned as outsiders to an Emirati ‘in-group’. In these artistic responses, which are set against the backdrop of identity-defining heritage activities, issues of belonging and the articulation of alternative identities play a paramount role. Artists engage with several distinct narratives in discourses around heritage. One such narrative concerns the connection between the people and the land – the idea that cultural heritage and national heritage are inextricably related. Art practices such as Land Art (in which artists deal directly with the natural environment) respond to this in both appraising and critical ways. Even artworks that seem to affirm the state’s idea of an untouched natural landscape, free of the cosmopolitanism of cities, incorporate traces of cross-cultural contact that destabilise this particular narrative of untouched lands and culture. Another prevalent set of narratives in heritage festivals centre around survival in harsh environments and making a living from the desert or the sea. Exemplary traditional forms of labour, such as pearl diving or Bedouin sadu weaving, are exalted in heritage festivals across the country. Artists, however, are quick to point out that this narrative excludes both the country’s trade relations with Indian Ocean communities and the contribution of foreign workers to the country’s economic prosperity. Their artworks examine and question labourers’ invisibility in the official narrative, one that persists even while labourers dominate the street scene in everyday life. Issues of labour are part of a larger discourse on politics as well. Sheikhs in the UAE are highly popular and hold a tight grasp on political power. Not surprisingly, the UAE’s political system and its leadership are given reverential treatment during heritage festivals and other cultural initiatives. In the hands of artists, issues such as the UAE’s leadership cult are addressed more critically, even if not upfront or provocatively. It is noteworthy that although censorship does occur, such as at both the Sharjah Biennial 2011 and Art Dubai 2012, it is not the norm. Artists cleverly navigate between the permissible and non-permissible in their art practice, ensuring that their works are circulated, even if their work could be deemed too provocative. They produce alternative heritage scenarios or articulate their affirmative practices of belonging, relying on the protection granted by art spaces. Some works envision, for example, a different past to the static ‘national time’ of the pre-oil period, and demonstrate the state’s heritage efforts as one of an ‘imagined community‘. The 1970s and ’80s seem appealing to a young generation of artists who grew up during this time, since the cosmopolitan element of Gulf city life cannot be ignored so easily. While big developments such as the building of new museums like the Guggenheim or Louvre are most well-known, the artistic output from artists living and working in the UAE has only started to be addressed by scholars. Yet, examining artistic answers to current socio-political developments in the country is a worthwhile endeavour, since it has the potential to open up a new understanding of the complex nature of the construction of an Emirati national identity. Bad Behavior has blocked 342 access attempts in the last 7 days.